An Open Letter to the FOMC: Recognizing the Valuation Bubble In Equities John P. Hussman, Ph.D. The chart below is from one of the best tools that the Fed offers the public, the Federal Reserve Economic Database (FRED). 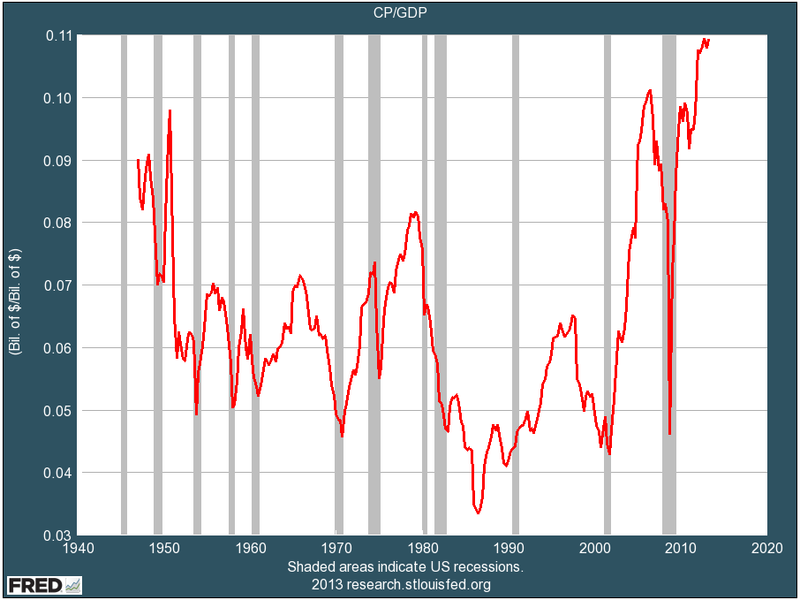 The chart shows the ratio of corporate profits to GDP, which is presently at a record. The fact that profits as a share of GDP are more than 70% above their historical norm should immediately raise a question as to whether current year earnings or next year’s projected “forward earnings” should be used as a sufficient statistic for long-term cash flows and equity market valuation without any further reflection. Then again, more work is required to demonstrate that such an approach would be misleading. We’re just getting warmed up. 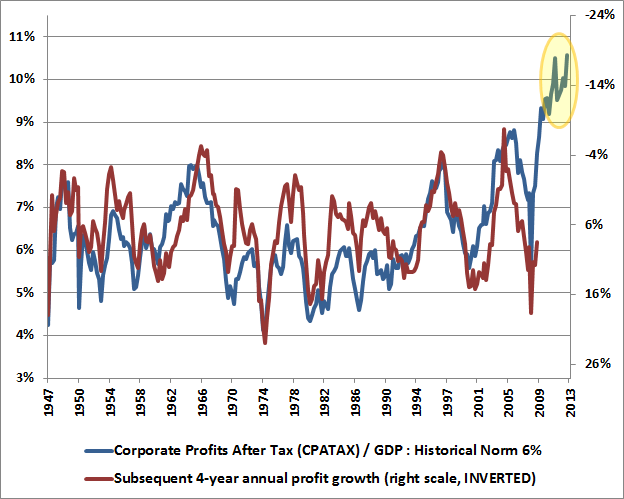 A simple way to see the implications of the present elevation of the profit share is to relate the level of profit margins to subsequent growth in profits over a reasonably “cyclical” horizon of several years. Remember, when one values equities, one is valuing a long-term stream, not just next year’s earnings. Investors taking current-year or forward-year profits as a sufficient statistic should be aware that high margins are reliably associated with weak profit growth over subsequent years. 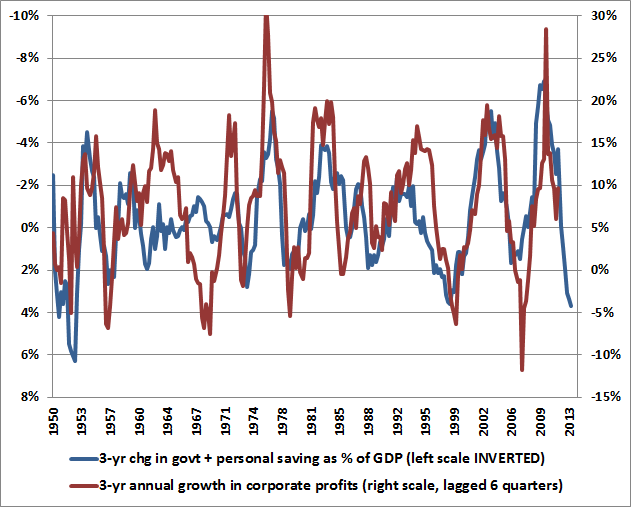 As a result, the above identity reduces – from the standpoint of overall variability – to a statement thatcorporate profits as a share of GDP are nearly the mirror image of deficits in the household and government sectors. A simple way to think about this is that dissaving in both sectors helps to support corporate revenues and limit the need for competition, even when wages and salaries are depressed. 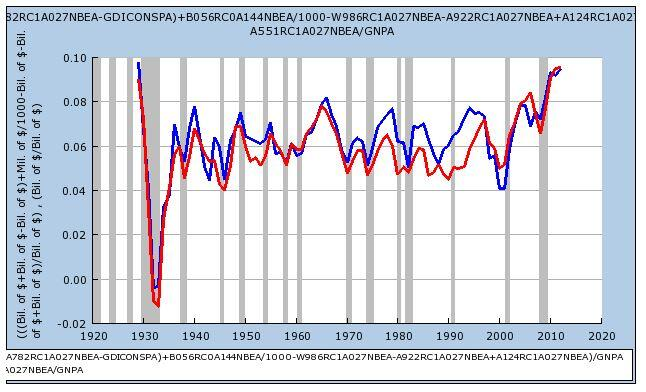 It follows that most of the variability in corporate profits over time is driven by mirror image variations in the household and government sectors. As it happens, this relationship turns out to be strongest with a lag of roughly 4-6 quarters. Given the general improvement in combined government and household savings that began just over a year ago, it follows that current-year or even higher year-ahead earnings estimates may not be particularly useful “sufficient statistics” for the purpose of valuing equities.